The Vango Genesis 500 is an example of the new generation of inflatable tents that is starting to gain ground in the camping equipment market. This review is based upon experience gained during its use as a base camp tent on a weekend youth group camp. First of all it is worth noting that this is a BIG tent, both in terms of when it is packed (80 cm long x 40 cm wide x 45 cm high) and when it is erected (500 cm long x 300 cm wide x 210 cm high. It could be carried in a canoe but, given its size is more likely to be suited for use at a base camp location or on a camp site. At 15.5 kg in weight, it is definitely not something that you’ll want to be carrying too far. It is remarkably simple to put up. 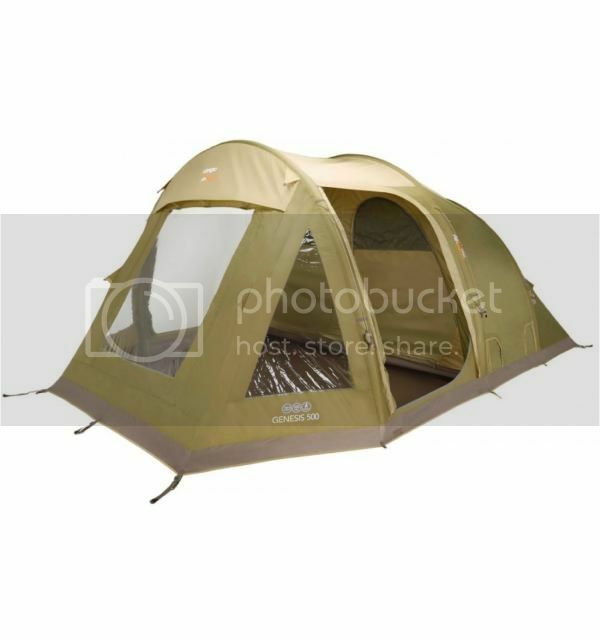 Most large tents need at least two people to erect however, this tent can easily be put up single-handed. 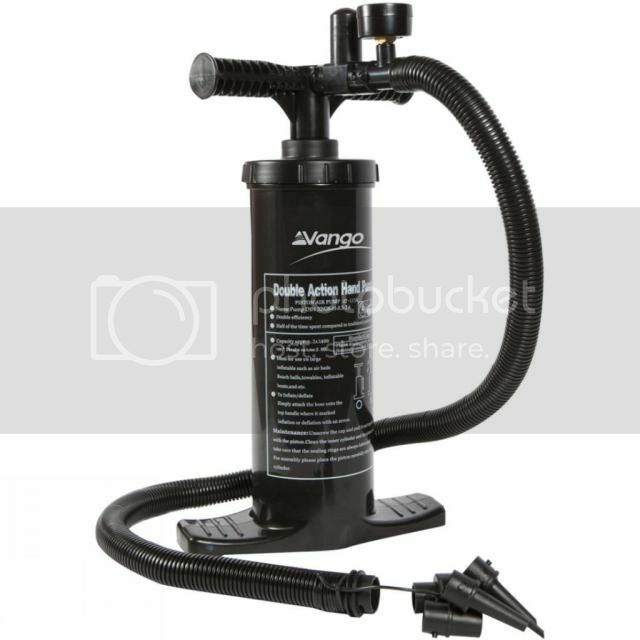 It really was simply a case of: (1) remove the tent from its bag; (2) roughly peg out the corners of the tent; (3) pump up the ‘airbeams’ to the pressure shown on the dial of the hand-pump provided; (4) adjust the corner pegs and then roll out and peg down the guy ropes. Altogether this was completed in well under 10 minutes by one person even though we’d never seen the tent erected before. Given its design, it could be erected in a strong breeze but, it’s not a mountain tent, so don’t expect to be able to pitch it up in a gale. Once the tent was up we had the chance to examine our new abode. 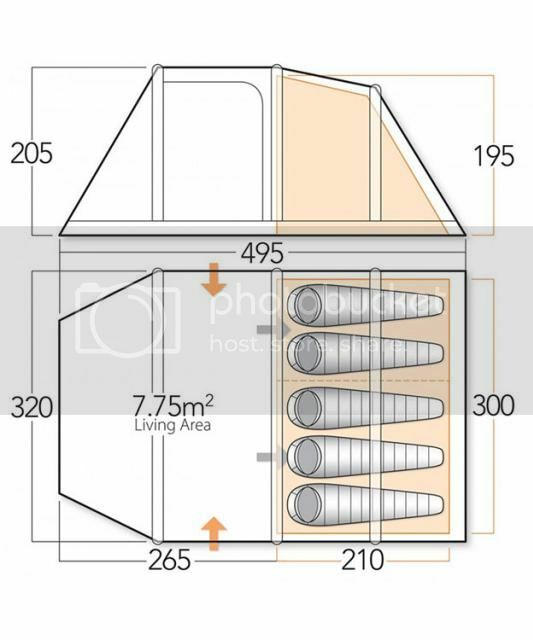 The tent has three compartments: two window-less sleeping compartments at the rear and a large windowed admin compartment at the front with entrances to either side. The partition between the two sleeping compartments can be readily removed to create a larger and more flexible space. Even with three adults in the tent, it was spacious in the extreme and even a 6-footer can stand up comfortably inside both the porch area and sleeping compartments. On the night we used the tent the weather provided a range of challenges. In the rain, the tent shed water well and there was no seepage whatsoever either from the top downwards or through the sewn-in groundsheet. When the breeze picked up the tent was rock solid with the ‘airbeams’ being, if anything, more rigid than comparable flexible aluminium poles. Later, the sky cleared and the temperature dropped fast to near freezing but, the tent proved surprisingly well insulated for such a big tent. Overall, a good experience in use. The following day we had to take the tent down and pack it away and this was the only real area of where any criticism could be levelled. Deflating the ‘airbeams’ is a simple case of unscrewing the valves and letting the air out – quite a whoosh given the high pressure! After lifting the pegs and rolling up the guy ropes we then tried to roll up the tent and pack it away. This was a little bit of a wrestling match and definitely a two-person job and it took us three attempts to get the beast back in its bag – something that a stronger and larger bag with compression straps would readily address. 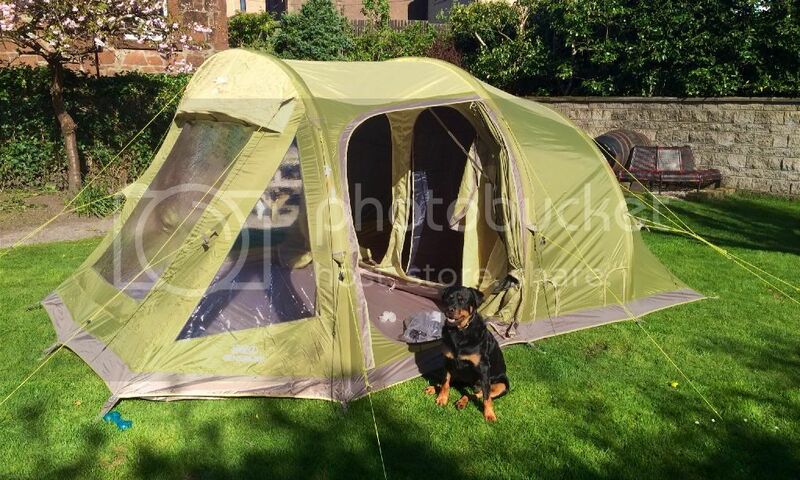 With an RRP of £550 (seen on sale with Ellis Brigham for £419) you are getting a lot of tent for your money. It goes up quickly and easily and will stand up to most of what the British weather will throw at it in the Spring-Summer-Autumn months. It is well layed out and plenty big enough for family use in a fixed location. What it isn’t is compact or lightweight but, it’s not meant to be. One improvement would be a stronger and larger bag but, if that is the worst it can be criticized for, then it is still a good buy.